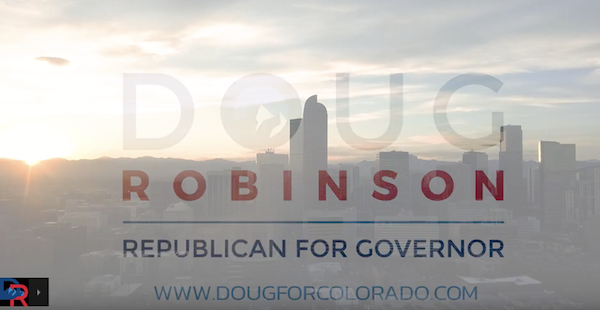 About the message: In this ad airing on cable TV in Grand Junction, GOP gubernatorial candidate Doug Robinson criticizes "sanctuary cities" and Democratic politicians who support them, including photos of current Democratic Gov. John Hickenlooper and Democratic gubernatorial candidate U.S. Rep. Jared Polis. Robinson says he'll "uphold the rule of law" and hold sanctuary cities accountable. The Republican candidate doesn't use the word immigration in the ads, though that is how it's characterized in cable ad contract documents. About the messenger: Doug Robinson is a retired investment banker and was one of four Republican candidates for governor in the June 26 primary, where he finished fourth. He's the nephew of 2012 GOP presidential candidate Mitt Romney. The messenger's money: Robinson pent about $779,000 in his run for governor, and loaned his campaign $300,000. He's supported by the independent spending committee Build Colorado's Future.